This week we began our own Peloponnesian War game on Friday, and in class we delved into the diplomatic tension that ended up bringing on a war between Athens and Sparta. Athens and Sparta represented two different ways of life, with two different basis of military power. During the Persian Wars between 490-479 B.C. they attained to a measure of foreign unity only because of a common foe. Afterwards they resumed their normal role of a “cold” animosity. 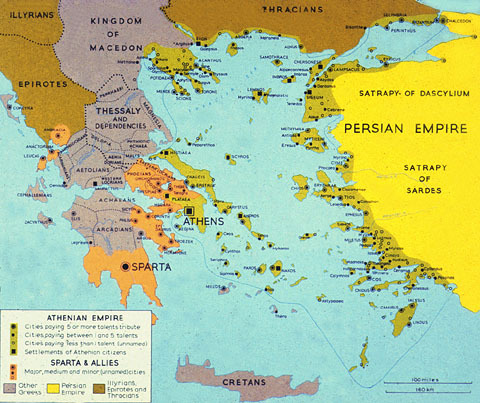 Just as the war began the Greek world looked like this. . . Some of us may remember Reagan’s idea of a “Star Wars” missile defense system. Many objected to the idea along the grounds that the project would not work or be too expensive, but many in Europe objected to it as well. Why would even our allies object to a defense system? Others saw that if the system worked, M.A.D. would be obsolete. The deterrent to war from the U.S. perspective would be gone, which might make offensive action from us more likely. Or, would the Soviets do a first-strike before the system became operational, knowing that their “time was short?” In this way, many saw the building of a “defensive” system as an essentially offensive act. Many in Sparta saw the situation in Athens the same way. If the Spartans could not invade and sack the city, then the Athenians had much less of a deterrent to venture far and wide with its navy. The walls had the direct purpose of defending themselves from attack, and after all, the Persians had sacked Athens during the Persian Wars. But, this was not how others interpreted their actions. When the Cold War began in the late 1940’s Secretary of State George Marshall urged those around him to delve into Thucydides’ The Peloponnesian War, for he believed that the conflict had significant parallels to the problems they would face. He proved prescient. Athens faced a crucial decision between the years 434-433 B.C. Corcyra had maintained neutrality in the run-up to what would be the war but faced a crisis. 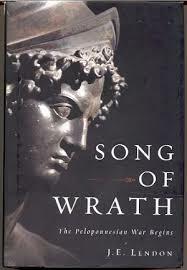 Corinth threatened them with invasion, and they knew that in time, they would likely fall in a protracted war. As a neutral they had no allies, but they could turn to Athens (Corinth was a Spartan ally, so they certainly could not ask for Spartan help). Athens heard from both delegations, and Thucydides records that the debate hinged on a few key points with one of them being the idea of the inevitability of war. The Corcyrans argued that conflict with Sparta would come sooner or later, but it would certainly come. Thus, you should ally with us because when war comes you want us as friends rather than enemies. Corinth countered with the opposite: peace was the current reality between Athens and Sparta and that had every reason to continue. War would only come by overt disruption of the peace, and Athenian ships tangling with Corinthian ships might be just the thing to bring on war. 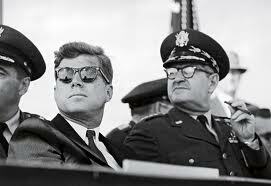 In the Cuban Missile Crisis of 1962 General Curtis LeMay believed that Kennedy should order a full-strike against the missiles in Cuba and initiate war with the Soviet Union. He knew that at the time we had a significant lead in nuclear weapons and would therefore win any kind of nuclear conflict. Yes, millions of U.S. citizens would die, but the Soviets would no longer exist and trouble us no more. If we waited, the Soviets would close the gap on our lead and then when war came millions more Americans would die and our victory would be much more in doubt. Athens had the same decision to make, and decided to attempt a halfway solution. They allied with Corcyra, but only for minimal defensive purposes. Most of the students approved of this option as a way to get the best of both worlds, and it could have possibly worked out. In actual fact, the presence of Athenian ships at the Battle of Sybota made Corinth hopping mad, but were not enough to tip the battle decisively in Athens and Corcyra’s favor. The Corinthian fleet would live to haunt Athens at a later date. Next week we’ll delve into the actual fighting as the war began. If you are interested in the speeches of Corcyra and Corinth as Thucydides records them, they can be accessed online, beginning with Book 1, Chapter 32. We know that the Children’s Crusades (both of them) ended in utter disaster. But what would you say in response to their argument? How can you disprove them? What is faith’s relationship to reason? This week we focused on what is known as the First Crusade, the only Crusade to actually reach Jerusalem and conquer the city. Perhaps more than other crusades, it was this first one that concentrated all that is admirable, strange, and horrifying about this period in the past. We discussed last week the reasons and motivations for the Crusades, and whether or not one agrees with their reasons, we cannot deny the enormous difficulty of the proposed enterprise. 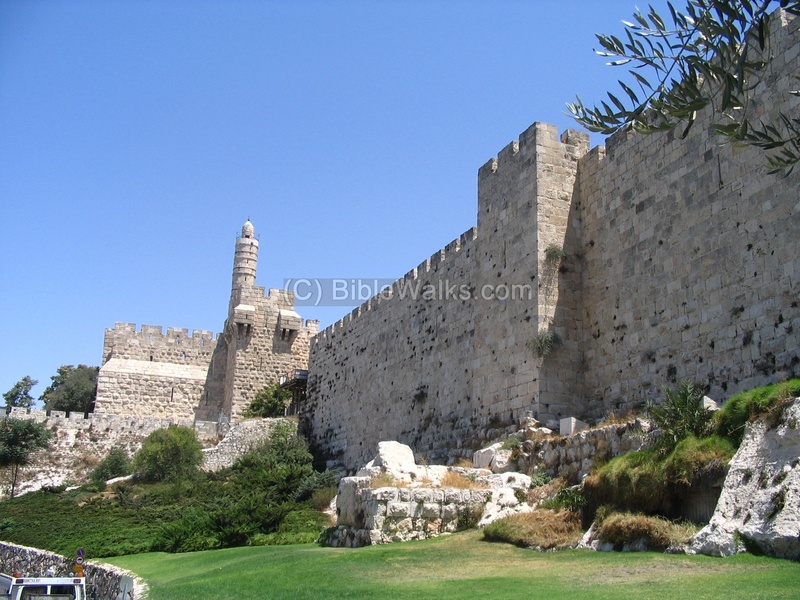 Capturing Jerusalem meant a journey of several hundred miles on foot without an established supply line, having to take at least one fortified city (Antioch) before even reaching Jerusalem, which would have thousands of defenders behind the large walls of the city. Even today, parts of the the “old” city of Jerusalem still stands, and we can see what the Crusaders saw themselves 1000 years ago. 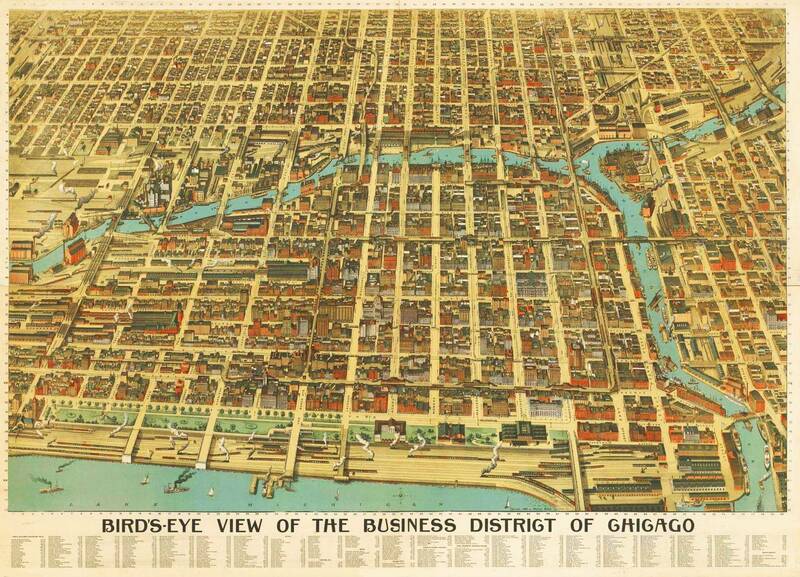 As anyone can see, taking the city would be a formidable task. From Antioch, the Crusaders approached the city barefoot, the standard mode of travel for all medieval pilgrims. This fact alone shows that the Crusaders saw themselves not so much as warriors first and foremost, but on a spiritual quest. Like Joshua they marched around the city. This was no standard military operation. Understandably, they were anxious to get inside the city and claim victory. 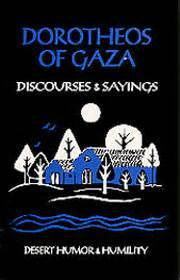 They had heard many stories of atrocities perpetrated against Christians in Jerusalem. They saw with their own own Moslem defenders taunting them, smashing crosses and other relics in front of their eyes. Moslems also apparently killed pages sent by the knights to get water, which horrified and enraged the Crusaders all the more. Finally, they broke through and entered the city. One eyewitness described it this way. . . When the morning came, our men eagerly rushed to be walls and dragged the [seige towers] forward, but the Saracens had constructed so many machines that for each one of ours they now had nine or ten. Thus they greatly interfered with our efforts. This was the ninth day, on which the priest had said that we would capture the city. But why do I delay so long? Our machines were now shaken apart by the blows of many stones, and our men lagged because they were very weary. However, there remained the mercy of the Lord which is never overcome nor conquered, but is always a source of support in times of adversity. One incident must not be omitted. Two women tried to bewitch one of the hurling machines, but a stone struck and crushed them, as well as three slaves, so that their lives were extinguished and the evil incantations averted. By noon our men were greatly discouraged. They were weary and at the end of their resources. There were still many of the enemy opposing each one of our men; the walls were very high and strong, and the great resources and skill that the enemy exhibited in repairing their defenses seemed too great for us to overcome. But, while we hesitated, irresolute, and the enemy exulted in our discomfiture, the healing mercy of God inspired us and turned our sorrow into joy, for the Lord did not forsake us. While a council was being held to decide whether or not our [seige engines] should be withdrawn, for some were burned and the rest badly shaken to pieces, a knight on the Mount of Olives began to wave his shield to those who were with the Count and others, signalling them to advance. Who this knight was we have been unable to find out. At this signal our men began to take heart, and some began to batter down the wall, while others began to ascend by means of scaling ladders and ropes. Our archers shot burning firebrands, and in this way checked the attack that the Saracens were making upon the wooden towers of the Duke and the two Counts. These firebrands, moreover, were wrapped in cotton. This shower of fire drove the defenders from the walls. Then the Count quickly released the long drawbridge which had protected the side of the wooden tower next to the wall, and it swung down from the top, being fastened to the middle of the tower, making a bridge over which the men began to enter Jerusalem bravely and fearlessly. Among those who entered first were Tancred and the Duke of Lorraine, and the amount of blood that they shed on that day is incredible. All ascended after them, and the Saracens now began to suffer. Strange to relate, however, at this very time when the city was practically captured by the Franks, the Saracens were still fighting on the other side, where the Count was attacking the wall as though the city should never be captured. But now that our men had possession of the walls and towers, wonderful sights were to be seen. Some of our men (and this was more merciful) cut off the heads of their enemies; others shot them with arrows, so that they fell from the towers; others tortured them longer by casting them into the flames. Piles of heads, hands, and feet were to be seen in the streets of the city. It was necessary to pick one’s way over the bodies of men and horses. But these were small matters compared to what happened at the Temple of Solomon, a place where religious services are ordinarily chanted. What happened there? If I tell the truth, it will exceed your powers of belief. So let it suffice to say this much, at least, that in the Temple and porch of Solomon, men rode in blood up to their knees and bridle reins. Indeed, it was a just and splendid judgment of God that this place should be filled with the blood of the unbelievers, since it had suffered so long from their blasphemies. The city was filled with corpses and blood. 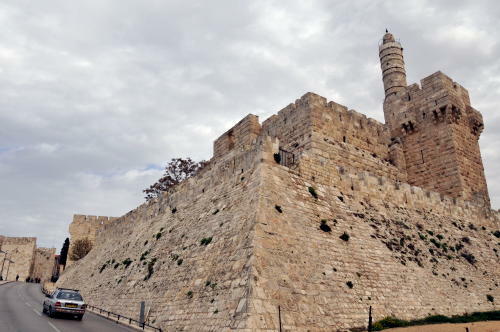 Some of the enemy took refuge in the Tower of David, and, petitioning Count Raymond for protection, surrendered the Tower into his hands. 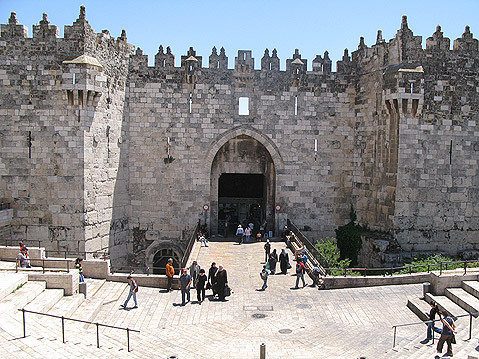 Many fled to the roof of the temple of Solomon, and were shot with arrows, so that they fell to the ground dead. In this temple almost ten thousand were killed. Indeed, if you had been there you would have seen our feet colored to our ankles with the blood of the slain. But what more shall I relate? None of them were left alive; neither women nor children were spared. When the pagans had been overcome, our men seized great numbers, both men and women, either killing them or keeping them captive, as they wished. Now that the city was taken, it was well worth all our previous labors and hardships to see the devotion of the pilgrims at the Holy Sepulchre. How they rejoiced and exulted and sang a new song to the Lord! For their hearts offered prayers of praise to God, victorious and triumphant, which cannot be told in words. A new day, new joy, new and perpetual gladness, the consummation of our labor and devotion, drew forth from all new words and new songs. This day, I say, will be famous in all future ages, for it turned our labors and sorrows into joy and exultation; this day, I say, marks the justification of all Christianity, the humiliation of paganism, and the renewal of our faith. “This is the day which the Lord bath made, let us rejoice and be glad in it,” for on this day the Lord revealed Himself to His people and blessed them. 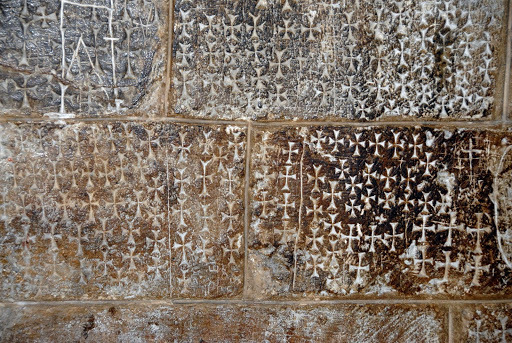 The “Jersusalem” crosses they etched inside the Church of the Holy Sepulchre can still be seen today. While we do know that some of the crusaders risked their lives to protect civilians, most joined in the carnage and plunder. The stain left by this atrocity lingers to this day in minds of many Moslems. This may seem strange to Americans, but Americans in general have very, very short historical memories. This is probably because we are a new nation, and an immigrant nation. Many who came here wanted to make a clean break with the past. Also, Americans tend not to be rooted in the past with tradition, but look forward to the “next” thing. Most other societies, and perhaps especially the Mid-East have a much deeper sense of the past, a sense only exacerbated by the significant decline of Moslem power since the mid 16th century. I related to the students that, in most of the “mountain disaster” books I have read that the problems occur when the climbers descend. We psychologically ramp ourselves up to reach the summit, and don’t always give as much thought to what comes next. The crusaders faced a similar problem. They took vows to liberate Jerusalem, but not to stay and defend it. Many had been away from home for more then two years, and understandably wanted to return, having fulfilled their purpose. The west simply could not rally the manpower needed to hold the city, and in 1187 the Moslems retook it. 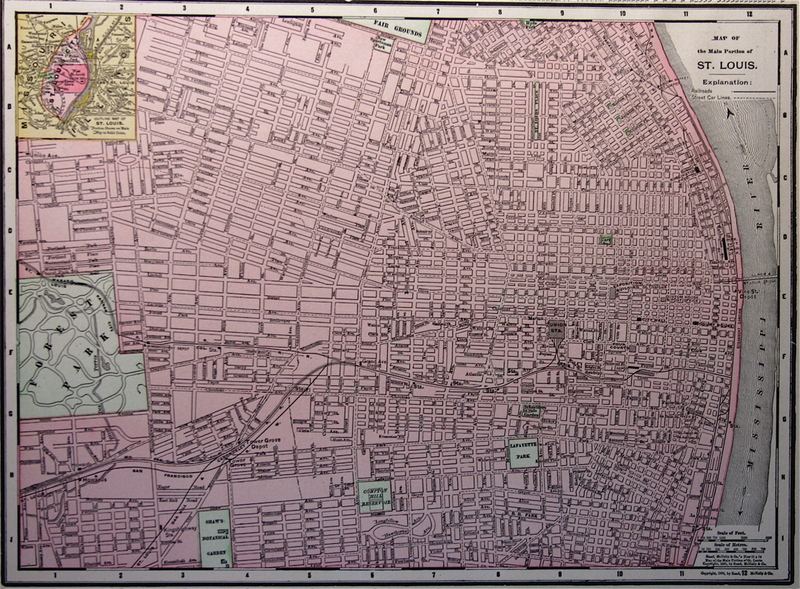 Several more attempts to retake the city would again be made, the subject of our study next week. For years now I have wondered how many books actually get published. In the Christian book world every year, for example, more books on prayer, grace, parenting, and so on tumble off the shelves. Those I glance at sound almost exactly the same. Of course it’s no business of mine, but nonetheless, I am surprised. The same phenomena exists in the world of history as well, perhaps especially in ancient history. Here we deal with limited sources and unsure timelines, and so it seems that one can say only so much. When dealing with the Peloponnesian War I thought that we had reached our limit. The advent of archaeology and the concomitant renewed interest in the ancient world in the late 19th century begot groundbreaking history on ancient Greece. This all culminated, I thought, with Donald Kagan’s masterful four-volume work published in the 1960’s-70’s. Having read portions of those books, I thought that the final word had been uttered. Victor Davis Hanson’s disappointing A War Like No Other, and Nigel Bagnall’s even more disappointing book on the conflict proved to me that indeed Kagan had the last word. Now saying anything else would put one in an awkward position . . .
After all, in any field we should encourage new books because we have to encourage new ways of thinking. Maybe 90% of what gets published never need see the light of day but that 90% might be needed to get the 10% that shines new light just where it’s needed. Enter J.E. Lendon, Virginia’s own spirited iconoclast, and his new book Song of Wrath. Every student of the Peloponnesian War rightly begins with Thucydides, and he impresses immediately with his penetrating analysis and fluid arguments. He talks little about what would be for us, the curiosities of ancient life (commonplaces to them of course), and instead focuses on what moderns would tend to appreciate. For Thucydides, practical power politics and universal psychological principles explained the war. But Lendon points out that the very fact that Thucydides has to argue for his point of view shows that he departed from traditional ways the Greeks understood conflict. He did not reflect, then, a typical Greek understanding of the war. This does not mean he was wrong, but it means that we must wonder if this great authority spoke rightly. In the end, Lendon admirably challenges some of Thucydides’ key beliefs and conclusions. Lendon begins his work by discussing Achilles. The Iliad begins with a seemingly petty dispute between Agamemnon and Achilles over who has the right to a captured slave-girl. Agamemnon pulls rank on Achilles and takes Achilles’ woman which leads Achilles to withdraw from the fighting altogether. Most every modern reader inevitably views Achilles as a total heel, a petulant jerk who would rather see his companions die than accept Agamemnon’s decision, however unfair it may be. And yet Achilles, not Agamemnon or Odysseus, remained for centuries a revered hero of the Greeks, nearly worshipped by such luminaries as Alexander the Great. Lendon uses this as a window into what the Greeks valued and how they structured their world. Once we see the great value they placed on rank and honor, we understand the reasons for the war, and the reasons for certain strategies pursued by both sides much more clearly. Achilles earned his reputation by sacrificing all to the Greek concept of honor. We know that he sacrificed long life for glory in battle for starters, but he also willingly defies his king and his friends to preserve his honor. He reenters the conflict not when his honor receives satisfaction, but when his friend Patroclus dies. When Achilles fights he does so not for Agamemnon, but to revenge Patroclus, another key Greek concept. After slaying Hector, Achilles goes too far and succumbs to hybris. He drags around Hector’s body and initially refuses burial. For this, he suffers ignominious retribution in the form of an arrow from spineless Paris. But — he had a magnificent run before he ran aground, and that’s what mattered most. If we understand honor, revenge, and hybris, Lendon argues, we will understand the Peloponnesian War. [Sparta’s] greatest difficulty will be want of money, which they can only provide slowly; delay will thus occur, and war waits for no man. Further, no fortified place which they can raise against us is to be feared any more than their navy. As to the first, even in time of peace it would be hard for them to build a city able to compete with Athens; and how much more so when they are in an enemy’s country, and our walls will be a menace to them quite as much as theirs to us! Or, again, if they simply raise a fort in our territory, they may do mischief to some part of our lands by sallies, and the slaves may desert to them; but that will not prevent us from sailing to the Peloponnese and there raising forts against them, and defending ourselves there by the help of our navy, which is our strong arm. For we have gained more experience of fighting on land from warfare at sea than they of naval affairs from warfare on land. And they will not easily acquire the art of seamanship; even you yourselves, who have been practising ever since the Persian War, are not yet perfect. How can they, who are not sailors, but tillers of the soil, do much? They will not even be permitted to practise, because a large fleet will constantly be lying in wait for them. If they were watched by a few ships only, they might run the risk, trusting to their numbers and forgetting their inexperience; but if they are kept off the sea by our superior strength, their want of practice will make them unskilful, and their want of skill timid. Maritime skill is like skill of other kinds, not a thing to be cultivated by the way or at chance times; it is jealous of any other pursuit which distracts the mind for an instant from itself. The Athenians, Thucydides, and the ancients who commented on the war all approved of Pericles’ strategy, which the above quote outlines in bare detail. Essentially Pericles wanted to make Athens an island by bringing the population within its walls and refusing to fight the Spartans on land. Then, with their superior navy they could ravage the Peloponnesian coasts. Most moderns, on the other hand (myself included) have thought little of his approach. At best it appears a recipe to avoid losing rather than actually winning. At worst, it’s a passive strategy guaranteed to give all the advantages to the other side. Armed with this perspective, suddenly other aspects of the war made sense to me. Before I criticized Athenian coastal raids for wasting time and resources to achieve purely symbolic results. This led me to make broader conclusions about the vacillating nature of democracies at war. Lendon argues of course, that honor and rank have everything to do with symbolism. The Athenian coastal raids had nothing to do with “imposing their will” or tactical advantage, and everything to do with displaying status. So Lendon’s work not only entertained me, it has forced me to reconsider most of my lesson plans for teaching the war. Grudgingly . . . I give Lendon my thanks. Does any of this new analysis have a modern application in war? Some have suggested that 3rd-world warfare resembles many of these “traditional” concepts of honor and symbolism, and that we must abandon all the Cold-War principles that guided our statecraft. Some argue that acts of terrorism have a lot more to do with symbols of honor than tactical advantage.^ I cannot comment on this as I lack the knowledge to do so. But I do think we see a lot of the same principles in our modern political scene. Democrats and Republicans both press for legislation that will give them “honor” in their districts or with their national following, and often this legislation has mere symbolic value. Both sides too can obstruct purely for reasons of status, or to refuse honor to the other side. Some might argue that this is part and parcel of any democracy. If so, we will need to redefine our definition of democracy, and accept that at least in its modern context, it has little to do with Christianity. It may bear much more direct similarity to our pagan democratic ancestors, and to the song of wrath sung in ancient times . . .
Atreus’ son the lord of men and brilliant Achilleus. . . .
*In Kagan’s great work he comes close to understanding this. He addresses the modern puzzlement over Pericles’ strategy by pointing out that the Athenians essentially voted for it on multiple occasions and kept it going even after a plague struck their city In other words, he points out that the strategy surely made sense to them and they must have thought it effective for their purposes. Lendon argues that after a few years, Athens could have made a legitimate argument that they had won and proved themselves. The problem with such conflicts lie in that they need interpreted, and Sparta did not interpret events as the Athenians did. So the war continued, and in time ended with defeat for Athens in a way no one could misconstrue. ^The tragic attacks on Charlie Hebdo led to a massive and inspiring show of solidarity from the French public. I applaud them, and to us it appears as a striking rebuke to terrorists. Part of me wonders, however, if the terrorists derived a sense of satisfaction from it all, i.e. “Look at what we made them do! Clearly we touched a nerve, which is what we really care about.” Did they gain status and honor from such a demonstration? I hope not. But if the answer is “yes,” the show of solidarity for the side of freedom is worth it regardless of how it gets interpreted by radicals. This response is also very exciting. The week before break we wrapped up our look at Teddy Roosevelt and the Progressive Era. How did he begin the ‘modern’ presidency? 1. America’s rising power (I think China today is in the position America was 100-120 years ago) meant that they had a role on the world stage. Foreign policy is the purview of the executive, not the legislative branch. Inevitably then, the power of the presidency increased as our power relative to the rest of the world increased. 2. A united America would now think of themselves as ‘Americans’ instead of ‘Virginians,’ for example. In a sense, all the people elect the president, at least in a way that ‘the people’ do not elect senators from Maine. The formation of a nation would again, put focus inevitably on the presidency. Along with this, the ‘nationalization’ of industry would lead to a more national focus for media outlets. National news and national figures would take precedence over local ones. Roosevelt believed in the establishment of national parks. Part of this was personal, as Roosevelt’s experience in the west transformed him. But part of it stemmed from his belief that the land did not belong to individuals, so much as to the nation at large. Land then, could be used only as it referred to the public at large (he did of course believe in private ownership as well). Having land set aside for the public fit right in with this vision. 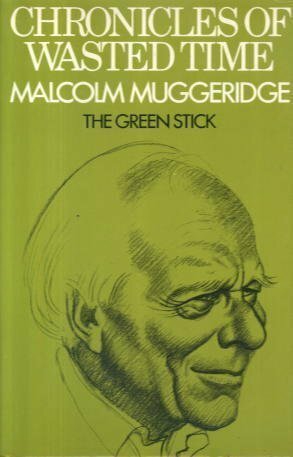 . .
As did his vision of corporate power and regulation. The economics of the Industrial Revolution concentrated enormous resources in the hands of a few. Are economic monopolies consistent with an American view of liberty? Well, that depends. If you see liberty as freedom from outside constraint, then there could be nothing inherently wrong with monopolies, provided they were honestly obtained. But Roosevelt saw monopolies as a threat to liberty. Monopolies limited the people’s ability to chose, and opened up the possibility that they could be exploited. Besides, monopolies eliminated competition. As the students are reading for homework, Roosevelt believed that only a ‘Strenuous Life’ could make us great. Monopolies could lead to laziness, and in the end, national decline. These issues raise important questions of constitutional interpretation. Does the Constitution proscribe a certain attitude towards federal power? What is the truest meaning of ‘liberty?’ How should we balance individual liberty with the rights of others? I enjoyed our discussions on these questions, and we related them to the recent controversies surrounding the new body scans at airports. 1. Does capitalism share common ancestry with Darwinism? Both rose to prominence at about the same time. Both stress that it is through competition that we progress. Both shed few tears over those whom competition eliminates. Both, curiously enough, have a certain fatalism to them in their purest form, one of class strife, the other of the invisible hand of the market. Fatalism, no matter the form it takes, is usually a sign of exhaustion or boredom, whether in the individual or the civilization. C.S. Lewis argued in ‘Mere Christianity’ that a fully Christian economic system would resemble socialism or communism in some key ways (see his ‘Social Morality’ chapter in that book if you are curious). Taking a different rout. 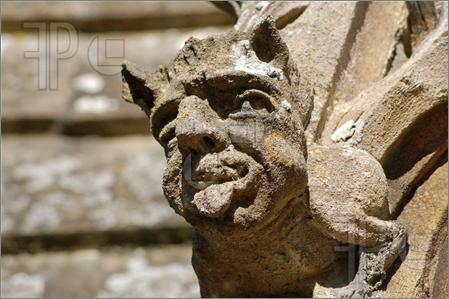 a Christian defense of certain key free market principles can be found here. Others would counter that while the free market of the Industrial Revolution had its problems and inequalities, surely the end result proved beneficial? The western world saw unprecedented economic growth and the rise of a truly broad based middle class that is still the foundation of modern democracies. When all was said and done, standards of living increased, and more people had access to more goods than ever before. 2. If there are links between Darwinism and capitalism, what does that do to our interpretation of capitalism? Do we affirm it in full, believing that Darwin may have latched onto a truth about existence? Or does the market need regulated, or ‘softened’ to inject more community oriented values? 3. What might the doctrine of the Trinity have to do with this question? With God we have community (1 God) and individuality (3 Persons) cohering in their fullness simultaneously. We, however, are finite, and so we cannot experience both individuality and community in their fullness simultaneously. Being made in the image of God, we desire and need both. Might much of our political debates, both then and now, be helpfully viewed through this prism? How should a society’s economic structure reflect both individual and community values? Where should the emphasis lie? 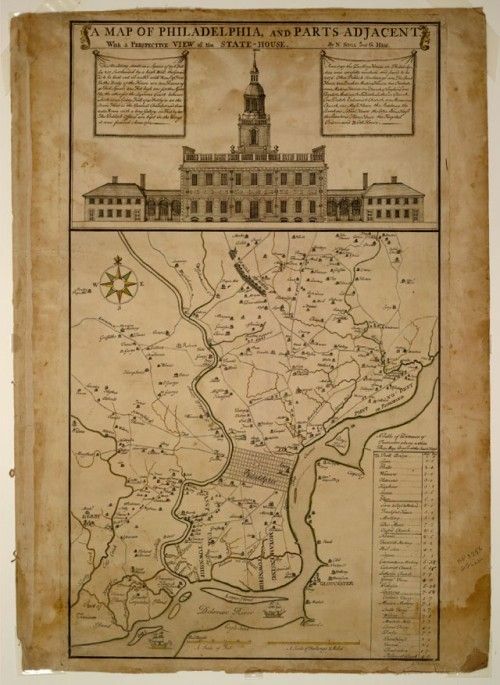 Granted, it’s not as if Philadelphia had no order to it, but the sense of standardization is less. I realize it won’t shock anyone to say that Paul McCartney in his heyday was a great songwriter. But listening to a few different songs recently made me realize that McCartney fails to get credit for his skill with the bass guitar. The Beatles could write songs, yes, and they could sing. But they wouldn’t have earned their reputation as one of the great all-time bands if they lacked genuine skill on their instruments, and McCartney is no exception. McCartney’s father had a musical career largely playing show tunes and bouncy, playful big-band numbers, and McCartney has this sunny whimsy in his personality. I think Lennon grew to resent this side of McCartney — the side that led him to write songs like, “When I’m 64,” and “Penny Lane.” Lennon wanted “to rock” and saw songs like this as wimpy, soft, and (heaven forbid) “square.” Lennon of course had a playful side too (i.e., “I am the Walrus”) but used it to destroy conventionality (“I am the Walrus”), not to write fun sing-along numbers. Lennon loved to destroy — not always a bad thing. The lesson perhaps for the Lennon’s of the world (more absolutist than most) is not to throw the baby out with the bathwater. Perhaps we could also say that certain skills or tendencies that annoy us in one way might have unexpected benefits in other ways.